Have you thought about your New Year’s Resolution yet? How about supporting a charity event this January? 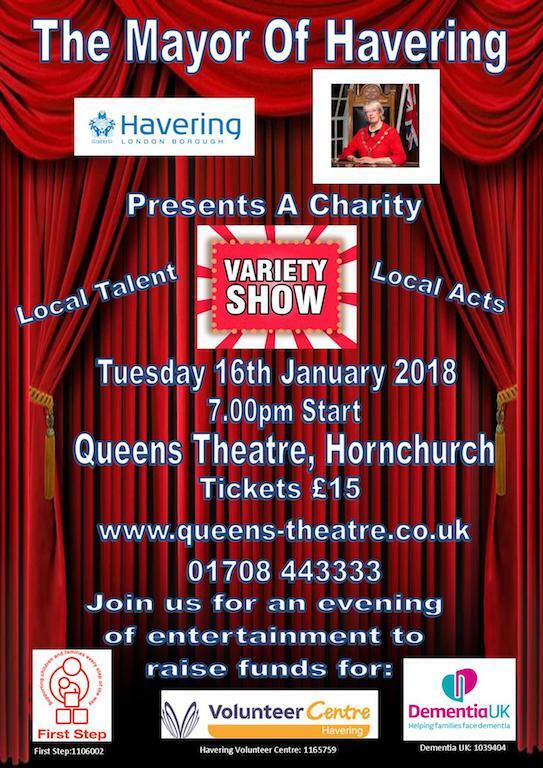 To celebrate Havering’s talent and support her 3 charities, the Mayor is hosting a Variety Show at The Queens Theatre Hornchurch on 16th January 2018 from 7pm to showcase the wealth of local entertainers we have in our community. There are still more wonderful performances to be announced!! We invite you to join us in a most enjoyable evening of foot tapping entertainment! Tickets are £15 and can be purchased now from Queen’s Theatre Box Office http://www.queens-theatre.co.uk/whats-on/show/charity-variety-show-2018 I have attached a flyer to this email with more information regarding the event, please pass this on to anyone you feel may be interested in attending. If you need any additional information please contact the Havering Volunteer Centre 01708 922214 or volunteering@haveringvc.org.uk and they will assist you further.